Tourism in India has a lot of potential. However, although infrastructure and services are steadily improving in many of the country’s regions, there’s no lack of conflict. Even India’s biggest attractions haven’t been spared. If you want to experience what the travel industry calls “overtourism“ (the overuse of tourist attractions because of too many visitors) in India, you should travel to Agra to visit the Taj Mahal. The country’s most famous building has been suffering for years from an enormous onslaught of domestic and foreign tourists. The substance of the structure is being increasingly affected. Around 8 million people visit the building annually, including the crowds, the litter and the restricted views due to so many other visitors. Having said that, using this phenomenon as proof of India’s dynamic tourism, quickly becomes misleading. Because many other places in the country suffer from underdevelopment rather than overdevelopment, even though many regional actors and investors would like to change that. Developer Chetan Bande from Mumbai can tell you a thing or two about that. In 2017, he opened an attraction in the district Bandra, which you could only find up to then in India’s business metropolises. The AB Celestial, a four-story, luxury yacht, wants to allow local and international tourists indulge in gourmet food, nightlife, and an exclusive view of the megacity’s skyline, as the first swimming hotel and restaurant in town. “The ship will give tourism in my town a boost,” Bande believes, who runs the “floating hotel” with his wife. The bureaucratic struggle that the investor had to contend with from the start is at least as impressive as the ship itself. During an exhausting project phase, he had to get no less than 108 permits from different authorities. “We thought that we could open in six months, in the end it took three years,” Bande says soberly. This incident sheds significant light on India’s tourism economy, in which many actors have both ideas and capital at their disposal, but are slowed down by the country’s bureaucracy. Ideological and religious skeptics also often intervene in ways that may be hard for international guests to understand. Even the country’s most famous building isn’t spared from these kinds of controversies. There was a huge debate last October when a picture of the Taj Mahal disappeared from a national tourism brochure, because in the eyes of Hindu nationalists, the building from the Islamic Mogul period doesn’t represent the country’s true tradition. Uttar Pradesh, the tourist minister responsible for the brochure, immediately denied this, explaining that marketing the Taj Mahal as well as upgrading Agra to a digital "smart city" are of highest priority for both the state and federal government. Critics refer to the fact that international guests aren’t able to understand this kind of debate. “When local politicians decide what tourists can drink, then we can forget about all of our tourism hopes and dreams,” exclaims the newspaper, Indian Express, referring to the ban on alcohol in the state of Gujarat, which conservative politicians would like to expand. The country needs investment in transportation infrastructure and sanitation systems rather than religiously motivated regulations. In the end, all Indians, not only tourists, would profit from these investments, the paper argues. The government’s Smart City Initiative presents an opportunity for these kinds of investments. It’s supposed to equip 100 selected cities with modern digital infrastructure. 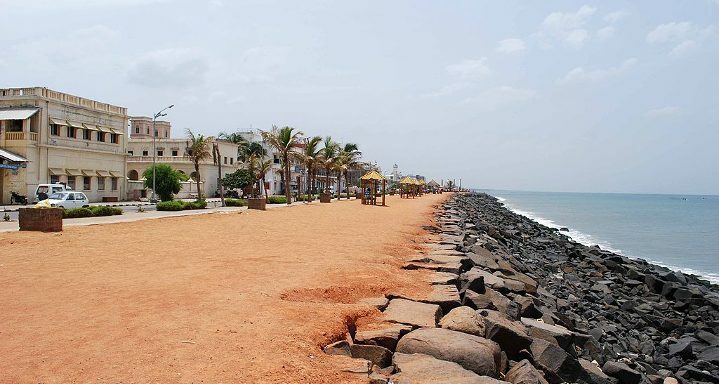 Pondicherry, a French-influenced city in the state of Tamil Nadu, is supposed to be expanded in a joint venture with the French government, making it into an internationally known tourist destination. Beach Promenade in Puducherry | © Sanyam Bahga | commons.wikimedia.org Other projects promise faster results. States like Uttar Pradesh want to expand their offers in yoga and Ayurveda, primarily targeting foreign guests. You’ll also notice that India is positioned as a top destination for yoga when visiting the southern Indian city of Goa. India’s most popular beach vacation destination has developed into one of the most attractive addresses for yoga lovers. It’s gone so far that many meditation courses there are being taught by foreigners, not Indians. So at this point some people are combining vacation with income. Regardless of the notorious criticism of authorities in India, there are current government projects in the country, which aim to realize more consumer-orientated services. It will soon be much easier if you want to avoid domestic flights and rather travel by rail. Vacationers who want to travel around the eastern part of the country can now book tickets for Eastern Railways online up to a year in advance, thereby avoiding sold out trains and overcrowded ticket counters. In addition, things have gotten easier if you have an emergency. Tourists who need help now have the possibility of calling a national hotline, newly installed by the Ministry of Tourism. They offer help in ten languages, among them, German.